First job of the day was to start on the rocker. Drill/ream the 1/8 mounting hole and profile on CNC mill from 1/8" ground sheet material, then move to the manual mill to drill and tap the grub screw. Next job was to mount the rocker bracket to the top cylinder cover. For this a 1/16" slot was milled for a tight fit. The bracket is secured by a 2-56 screw countersunk underneath the cover. Note that the gland is now secured with 4 screws and the small washers, and there's no more interference with the crosshead at BDC. Finally did a first fitup of most of the components. Things are quite close together, and without the eccentric and rocker attached it's hard to see where there may be interference. One problem that catches the eye with close inspection is that the rocker bracket arm is slightly out of parallel with the top of the cover. That will need to be corrected before anything else. The rest of the afternoon I spent shortening screws, mostly for the steam chest cover. I really like the look of that engine. Excellent work! That's why I wanted to build one. Saw it running 2 years back at NAMES. I think it's particularly well suited for CNC for a fairly fast build as there are relatively few parts. The parts list shows 71 different items of which 21 consist of screws, nuts, washers, or pins needing no machining. The remaining 50 are mostly single one-offs. Other than flywheel, frame material, and some screws, I had all the materials on hand. With the eccentric attached to the sliding link the motion is much different. 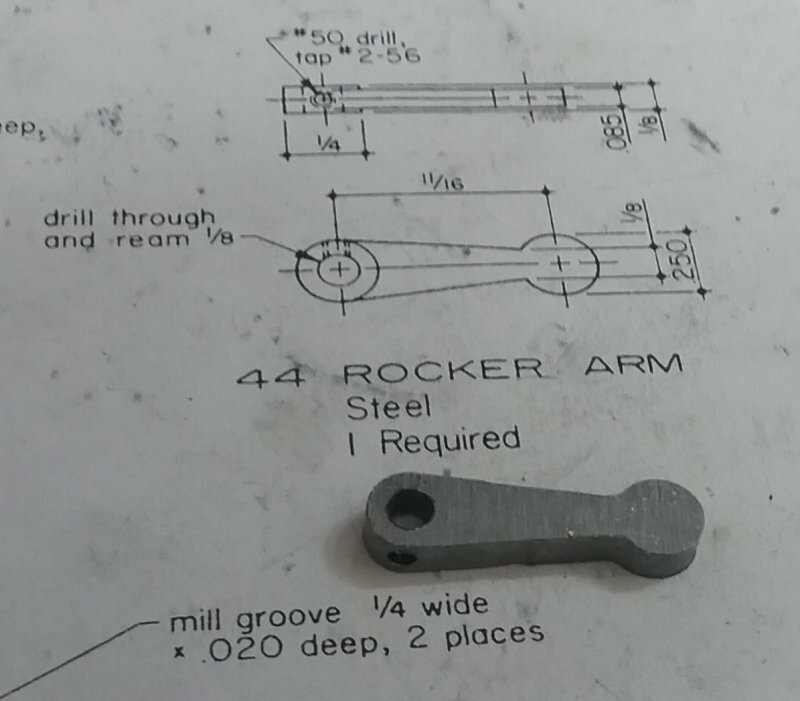 I have one place with a tiny rub between the rocker shaft and the screw head on the link, but a little filing can clearance that. I made an effort to square the bottom of the rocker bracket and the tube, but the tube still is at a slight angle to the top cover. First task today was to make an air supply attachment. I found a 3/8-24 grade 8 bolt at the hardware store; drilled though with a C drill and tapped 1/16-27 NPT into the head. Screwed into the inlet side of the pivot shaft. When I attached air supply the good news is that I can feel air coming out the exhaust. But manually moved the valve rod had no impact on moving the piston rod. Next I made some temporary frame spreaders from 10-32 threaded rod. The idea is to be able to adjust the separation to avoid any binding, and then measure to get price lengths on the eventual spreaders. With these in place I let the lathe turn the crankshaft for about 20 minutes total at 150 RPM. Loosened it up somewhat but there's still too much friction. The rocker needs to be "thinned" down to fit into the slot in the valve rod end. 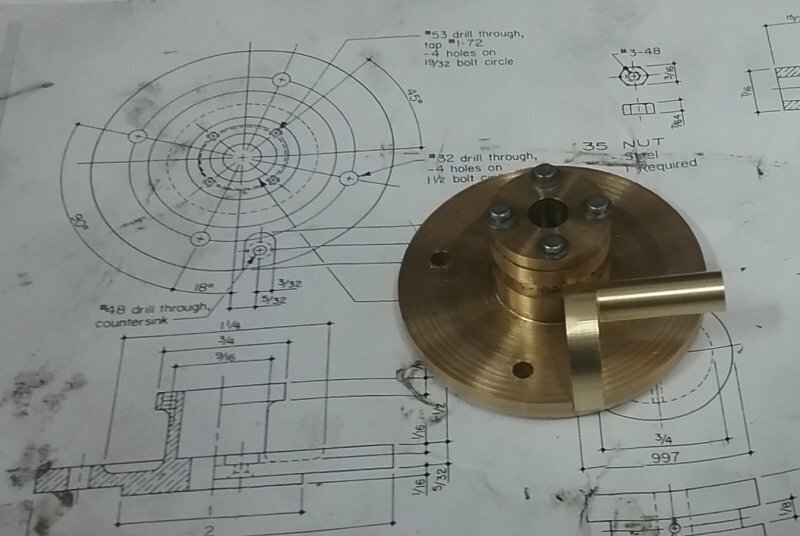 My plan to machining this was based on getting some Crystal Bond adhesive, as introduced some time back by Stan Shire. This adhesive melts at 175F, and also releases when heated with almost no residue. So I used it to glue the rocker onto a round disk, with a 5-40 screw to center it. Then the DRO on the lathe guides the cutting, which I tool with several .005" DOC passes. The other side was done the same way with piece of .020" shim stock underneath. Afterwards, it took a bit of filing to make the valve rod end fit, as the rounded ends of the slot were keeping the rocker from entering. Eventually I ended up with a fit. A test fit to the rocker bracket was very tight, needing to relieve the bracket on the side with the rocker. Installing all piece of the valve train is a nifty puzzle. I had to skim off 20 thou from the side of the rocker racket in order to get the rocker and valve rod end to line up, but I now have all the pieces installed so that the valve now moved when I rotate the crank. That means that I can actually try to time it. I removed the steam chest cover to observe the valve motion, and it's not far off being centered. However, I have slack between the eccentric strap and the sliding link that I want to reduce first. I've been using a 5-40 screw instead of the bolt Ouzof specifies. With air applied to the input I got good flow into the steam chest, so those tight 1/8" passages don't clog it up as much as I'd feared. Off to make the bolt mentioned above, plus a gib key to fasten the flywheel. 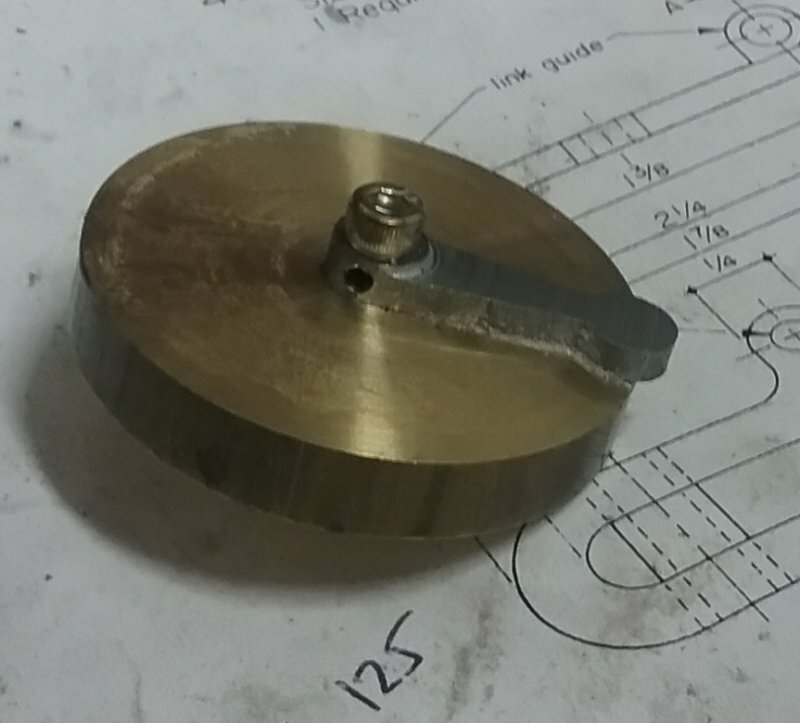 After making the gib key for the flywheel and replacing the screw for the link, I did an initial timing, buttoned it up, and prayed for karma when applying air. No luck there, and a fair bit of leaky hissing. I'll start by installing some packing for the rods before making any gaskets. Yup - the usual last minute filing, fussing, fettling, fusing, flattening, and general farting around to get the engine parts all seated just right! Thumbs up on the Chinese food. I stripped it all down and have ordered a sheet of PTFE to make gaskets. 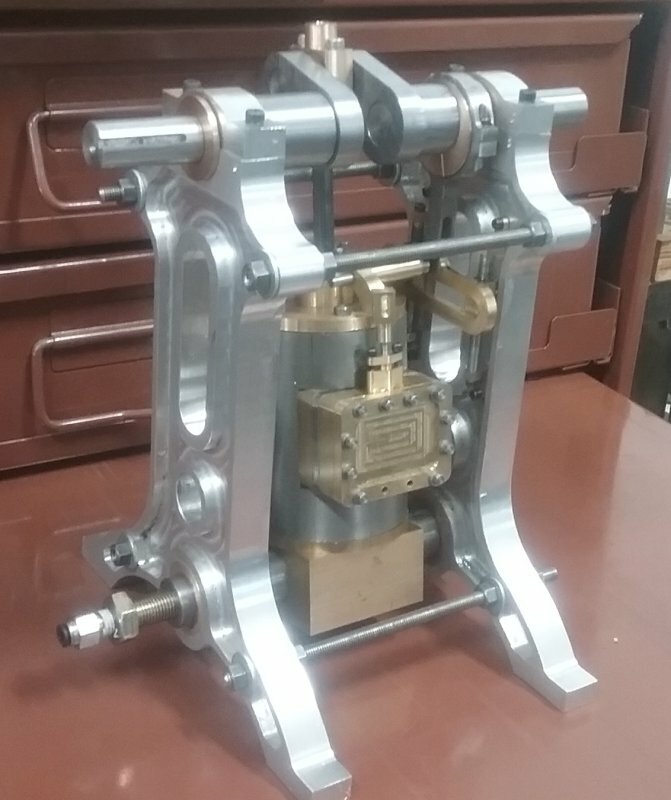 At least there is almost no leakage if any between the pivot shaft and pivot block, so I just need three round gaskets for the cylinder covers and three square ones for the steam chest. I doubt a flat gasket can seal the port block to the cylinder so some sort of silicone may be needed there. Try the duck sauce first . Build looking great BTW. That seems should go a long way to sealing the air leaks. I made a test piece with two machined aluminum surfaces, and leakage was minimal. So I'm using it for the moment. It's easy to clean off with alcohol, so if it doesn't work well I can regroup. Great stuff. Back in the day it was a very heavy shellac base, don't know about now. Their Copper spray is good also. That Permatex Aviation was specifically designed for sealing aircraft engines without gaskets. I've been using it for 60 years and can't live with out it!! After liberal application of the Permatex fluid the leakage is more less. I also used some PTFE tape to make stuffing for the glands. I adjusted the valve rod to give approximately (i.e., eyeball precision) even valve travel and the eccentric, but no joy on operation. A closer examination of the valve showed that when exactly centered over the port openings both ports were cracked open. In reviewing the plans, the outer edges of the ports are 17/32" apart. The length of the valve is supposed to be .550". 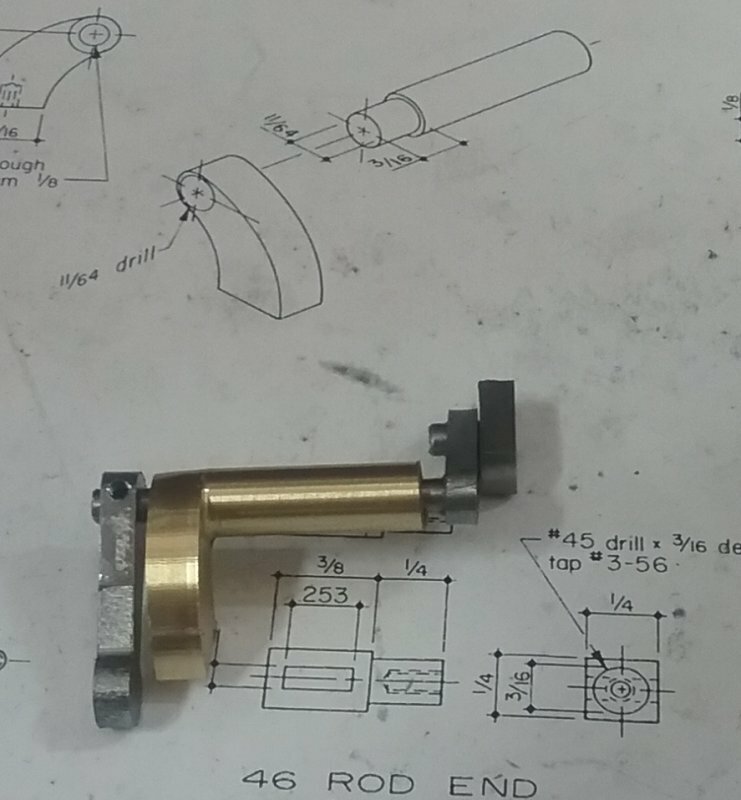 In reviewing the solidworks model I see that I drew the valve as .500" square, but I can't find any evidence I used the model when making the valve. In any case a remake is in order, and as soon as I disassemble the steam chest enough to remove the valve I'll know where the error lies. 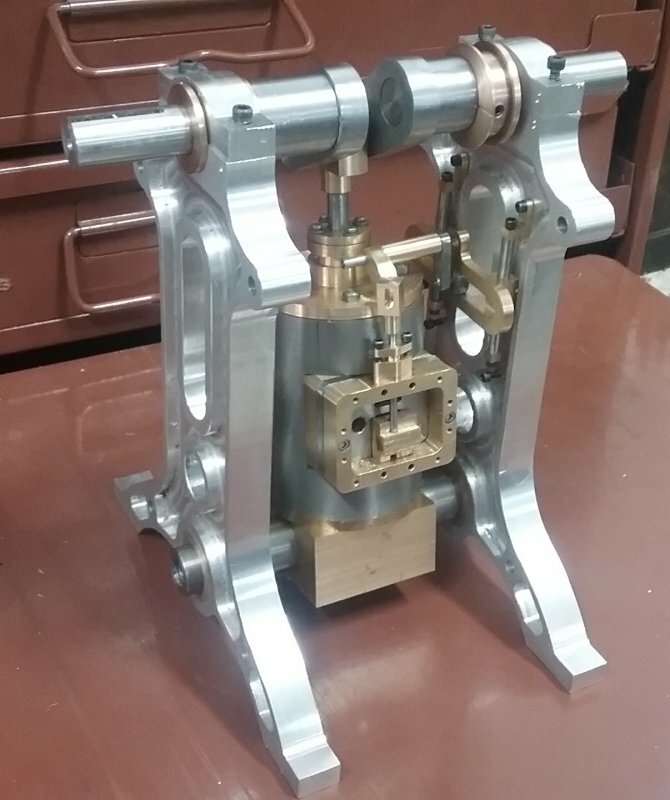 Yep, made the valve .5" square. This afternoon's job is now set.